A wise man once said, “Students should not merely go through college but college should also go through them.” His words resonate with me. Students’ educational encounters should be empowering and should change the way they see themselves and their relationship to history and the world. Exchanging ideas, from lecture hall to coffee shop, helps students find themselves in the educational process. I encourage them to voice their own experiences, ideas, and opinions and relate them to their work. In class, my students and I often foreground the voices of women, people of color, and the underclasses. By giving our global, communal, and individual mothers, brothers, grandparents and ancestors a central focus in our dialogue, we also give ourselves voice. We learn that we make history both “on the ground” and in the academy. History should not be imposed upon us. I hope to nurture students’ ability to express themselves with confidence– to expand their ideas and perspectives about themselves, their histories, and their world. 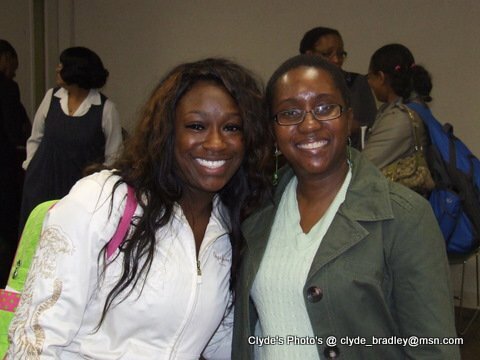 Kenja (right) co-hosted the Atlanta Oral History Roundtable at Atlanta Metro State College so her students could access such an event, which may have otherwise been closed to them. Conner, Robert C. General Gordon Granger: The Savior of Chickamauga and the Man Behind “Juneteenth. Philadelphia: Casemate, 2013. Foner, Eric. The Fiery Trial: Abraham Lincoln and American Slavery. New York: W.W. Norton, 2010. Holzer, Harold, Edna Greene Medford, and Frank J. Williams. The Emancipation Proclamation: Three Views (Social, Political, and Iconographic). Baton Rouge: Louisiana State University Press, 2006. Abernethy, Francis Edward, Carolyn Fiedler Satterwhite, Patrick B. Mullen, and Alan B. Govenar, eds. Juneteenth Texas: Essays in African-American Folklore Denton: University of North Texas Press, 1996. Ellison, Ralph, Juneteenth: A Novel. Edited by John F. Callahan. New York: Vintage International, 2000. Cantú, Fred. “Juneteenth Reveals Austin’s Shrinking African-American Population.” CBS Austin, June 17, 2016. http://keyetv.com/news/local/juneteenth-reveals-austins-shrinking-african-american-population. “Embracing Freedom: Juneteenth Celebrations: Interview with Mark Anthony Neal and Paul Mooney.” By Michel Martin. NPR: Around the Nation, June 19, 2007. http://www.npr.org/templates/story/story.php?storyId=11182637. “June 18, 1949.” Black Quotidian: Everyday History in African-American Newspapers by Matthew F. Delmont. Accessed May 21, 2017. http://blackquotidian.com/anvc/black-quotidian/june-18-1949. Douglass, Frederick. “What to the Slave is the Fourth of July?” TeachingAmericanHistory.org. Accessed June 14, 2017. http://teachingamericanhistory.org/library/document/what-to-the-slave-is-the-fourth-of-july/. “Draft of the Emancipation Proclamation.” The Civil War in America: December 1862–October 1863. Accessed May 21, 2017. http://www.loc.gov/exhibits/civil-war-in-america/december-1862-october-1863.html?loclr=twloc#obj4. Anderson, Jill. “Observing Juneteenth.” Selections from the University Library Blog 25 (2015). ScholarWorks@Georgia State University. http://scholarworks.gsu.edu/univ_lib_blog/25. Josh, “Juneteenth and Emancipation Day in Florida.” Florida Memory Blog, June 19, 2015. http://www.floridamemory.com/blog/2015/06/19/juneteenth-and-emancipation-day-in-florida/. Bouie, Jamelle. “The Black American Holiday Everyone Should Celebrate but Doesn’t.” Slate, June 19, 2015. http://slate.com/articles/news_and_politics/politics/2014/06/juneteenth_the_black_american_holiday_everyone_should_celebrate_but_doesn.html. Brown, Lynn. “The Story of Juneteenth.” JStor Daily, June 17, 2016. https://daily.jstor.org/the-story-of-juneteenth/?utm_source=marketing&utm_medium=social&utm_campaign=twitter. Davis, Kenneth C. “Juneteenth: Our Other Independence Day.” Smithsonian.com, June 15, 2011. http://www.smithsonianmag.com/history/juneteenth-our-other-independence-day-16340952/#prIFy7p7QIWlQWFy.99. Dingle, Joicelyn. “Juneteenth: Explaining an Unsung Holiday.” Ebony, June 9, 2016. http://www.ebony.com/life/juneteenth-explaining-an-unsung-holiday#axzz4B7S8DhNn. Dockterman, Eliana. “Here’s How America Observes Juneteenth.” Time, June 19, 2014. http://time.com/2903414/how-america-observes-juneteenth/. McGirt, Ellen. “How a Chef Is Exposing the Hidden Racism in ‘Southern’ Kitchens.” Fortune, June 17, 2016. http://fortune.com/2016/06/17/michael-twitty-juneteenth-freedom-day/. Tabor, Britney. “Juneteenth in Stories, Songs and Festivities.” Denton Record-Chronicle, June 9, 2016. Taylor, Charles. “Juneteenth: A Celebration of Freedom.” The Black Church and Juneteenth. Accessed May 21, 2017. http://www.njclc.com/njclchistory.html. Taylor, Quintard. “Juneteenth: The Growth of an African American Holiday.” Accessed May 9, 2017. http://www.blackpast.org/perspectives/juneteenth-birth-african-american-holiday#sthash.n7z5Raeg.dpuf. Tortorello, Michael. “Juneteenth Gardens: Planting the Seeds of Survival.” New York Times, June 13, 2012. https://mobile.nytimes.com/2012/06/14/garden/juneteenth-gardens-planting-the-seeds-of-survival.html?referer=. Bailey, R.J. Juneteenth. Minneapolis: Jump!, 2017. Jordan, Denise. Juneteenth. Chicago: Heinemann Library, 2008. Murray, Julie. Juneteenth. Edina, MN: ABDO, 2012. Nelson, Robin. Juneteenth. Minneapolis: Lerner, 2010. Nelson, Vaunda Micheaux. Juneteenth. Minneapolis: Millbrook, 2011. Peppas, Lynn. Juneteenth. New York: Crabtree, 2011. Ponto, Joanna, and Angela Leeper. Juneteenth. New York: Enslow, 2017. Smith, Maximilian. The History of Juneteenth. New York: Gareth Stevens, 2016. Beyond Emancipation: Juneteenth Booklist. Accessed May 21, 2017. http://www. “Juneteenth Lesson Plans and Resources.” Lesson Plans Page. Accessed May 21, 2017. http://lessonplanspage.com/juneteenth-htm/. “Teacher’s Guide for Juneteenth Jamboree.” Lee & Low Books. Accessed May 21, 2017. https://www.leeandlow.com/books/2417/teachers_guide.